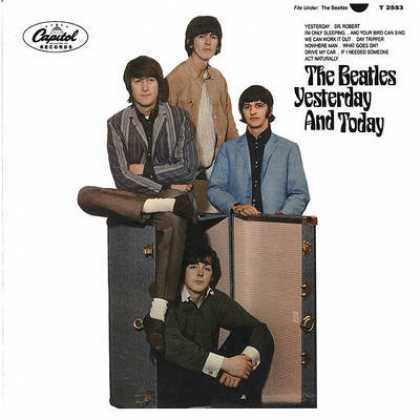 It is a fine, sealed, mint example of the legendary “Butcher Cover” – which is the generic name given by collectors for the original cover of the Beatles US release called “The Beatles Yesterday and Today”. Well, one original, un-pasted-over copy – still sealed in it’s shrink-wrap – has come up for auction on Ebay here. To give you some context of what copies of this item in good condition can sell for have a look at this YouTube item from the US version of Antiques Roadshow. Thanks to Web Wire for pointing to this item. Also to ivegotneatstuff.com for some more detail and the YouTube link. 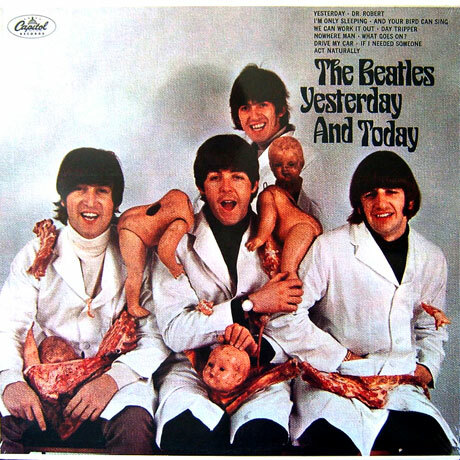 This entry was posted in Beatles, Beatles Collecting, Beatles Music, Beatles Related, George Harrison, John Lennon, Paul McCartney, Rare Beatles, Ringo Starr and tagged Beatles, Beatles Collecting, Beatles Related, Butcher Cover, George Harrison, John Lennon, Paul McCartney, Rare Beatles, Ringo Starr by beatlesblogger. Bookmark the permalink. My grandson picked up a Yesterday and Today lp at a rummage sale and it has the butcher cover under it. Anyone interested in buying this please contact me. I can send pics, but I am afraid to attempt removing the cover. We removed enough to reveal Johns finger and a portion of raw meat.